Watch the event live-streamed here. Good evening everyone. Thank you for coming tonight and being present with this important topic. Thank you Chepximiya Siyam’ Hereditary Chief Janice George of the Squamish Nation, we are grateful and humbled by your welcome. We are delighted to have you here tonight to open and also close the evening with some words of reflection at the end of the program. I would like to introduce Groundswell and the journey that has brought us to this event. Groundswell is an alternative business school that helps people find ways to contribute meaningfully to their communities and build sustainable livelihoods for themselves. I never thought I would be working for anything that calls itself a business school of any sort, but I was attracted to the Groundswell community because it is deeply rooted in a belief that everyone has something unique and valuable to offer the world, and that by staying true to values of social, environmental and economic justice, we can build a more beautiful world together by putting all these unique contributions of ours to work. Groundswell believes in building bridges, and we often find ourselves holding space for ideas from left to right across the political spectrum, people from across the east west divide of our city, and education that spans from the lean start up world of technology entrepreneurship to traditional aboriginal teachings. We feel this span helps us wake up a bit more, helps us imagine new possibilities of how we might work together to build better livelihoods and economies, and helps us work collectively towards healing the injustices of the past. One person that we met on this journey is Curtis Rattray, a Tahltan educator and founder of Edziza Trails, a back country aboriginal tour guiding company. Over the last few years, Curtis has delivered several workshops on decolonization and indigenous issues for participants in Groundswell's social venture programs. This past summer, we collaborated with Curtis to deliver an On the Land Indigenous Gathering to talk about reconciliation with young people from across western Canada. This Gathering took place in August at the Tahltan fish camp in the Stikine Grand Canyon. Tonight, we’re here to continue the conversations that started on the land this summer. We are planning to work with Edziza Trails and Curtis to make an On the Land gathering happen again next year, and all the proceeds from tonight’s ticket sales and your donations will go towards bursaries for the next On the Land Gathering. Update: $836 was raised at the December 4th event which covers one full bursary - thank you to all donors and people who made this event happen! I was fortunate enough to join the gathering up north, and being on the Land grounded me in my reconciliation work: this is the reason the work is important, this is what we’re in danger of losing completely if we do not take action to change the ways of our current economic and social systems. This is why we’re fighting pipelines and Site C, why we’re building ethical businesses to strengthen communities and benefit the environment, and not destroy them, and it is one thing we all have in common: we are all of the land and we must respect it and each other to survive and thrive. And there are thousands of years of knowledge of this land that is held by indigenous peoples, and we have so much to learn. On the Land Indigenous Gathering participants with Curtis up on the bluffs above the fish camp in Tahltan. We want to acknowledge that this conversation tonight and our organization’s work is taking place on the unceded territories of the Musqueam, Squamish and Tslei-Watuth Nations. Let’s think about where we are right now: Granville Island was a sand bar not that long ago, a place called Snauq, where people collected shellfish to eat and fresh water from a spring. With colonization and industrialization, this area was literally built up to 10 feet above the high tide line, and became known as Industrial Island. Since then, the ebb and flows of the economy, world wars, and new settlement patterns shaped this place to what it is today, a mix of industry, artisans and food markets, managed by the Federal Government's Canadian Mortgage and Housing Corporation. I wonder what further transformations will come to this place in the future? 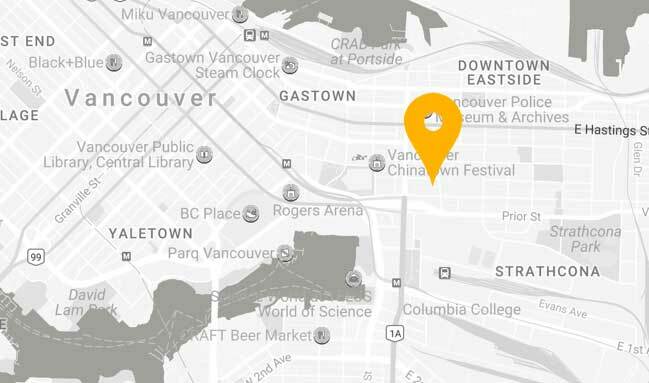 Tonight we are here to bring the conversation into the urban context, here in Vancouver where Groundswell does it’s main work. We are challenging ourselves and our peers - you, our fellow changemaking organizations and individuals, many who are in the room tonight - to participate in reconciliation in our daily work. It can seem so abstract in the city, or in reading the academic articles and policy recommendations, so we want to bring it down to a personal level. Because we, collectively, are shaping this place, by teaching, by building social ventures, by hosting and attending events, and so on. And on that note, I am humbled and full of anticipation for our next steps because so many of you are here to journey with us, so thank you! Many of us in the room tonight are just getting started in our journey of reconciliation, so we are honoured and so grateful to have the presence of indigenous people in the audience tonight who have been on this journey their whole lives, so thank you for your work, time, and energy. 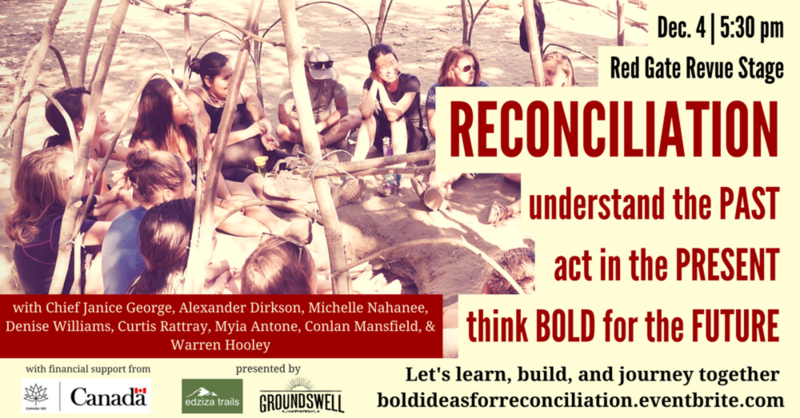 Our overreaching title for tonight’s event: understanding the past, acting in the present, and thinking bold for the future, is an acknowledgement that reconciliation is a big, complex, and intimidating concept. The astute panel of speakers: Alexander Dirksen, Joleen Mitton, Myia Antone, Conlan Mansfield, Curtis Rattray, Michelle Lorna Nahanee. Then we will look at the present: As you heard in the film, our goal was for the On the Land participants to identity action items for social change to move towards reconciliation for future generations. The participants echoed this and were seeking tangible steps - actions they can take now in the present, towards reconciliation, whether that is bringing reconciliation to the table in their organizations or learning more about their personal family history and culture. Tonight we are honoured to have several speakers including two participants from the gathering who will share what they are doing in their day to day lives, as entrepreneurs and community leaders, in their work towards reconciliation. And finally, we will hear the bold ideas that will shape the future and provide inspiration to guide us forward. We are here tonight to build relationships, and pledge a commitment to our participation in reconciliation. We are here to listen with open minds and humility. Warren Hooley taking us back to our bodies with movement and song after our intensely thought provoking speakers.